The Sober Look "we are back" post pointed to US swaps spreads as one of the key indicators to watch. Today the equity markets went into the "la la land" with the usual afternoon rally. After all Europe was closed, so what could go wrong? 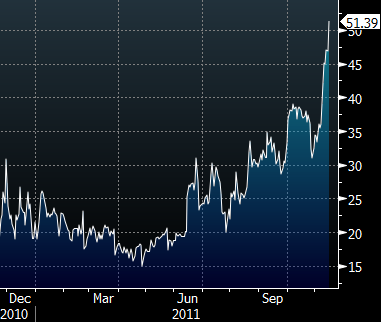 In the mean time the US swap spreads continued to widen, ultimately breaking 51bp (on the 2yr). That took the equity market down by over 1.5% in a violent last hour sell-off. This is clearly an unsettling development because it indicates increasing concerns about interbank funding. 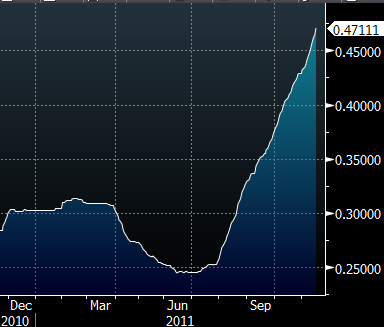 A simple chart of US LIBOR clearly points to that. Other interbank liquidity indicators such as the TED spread, the OIS spread, and US financials' CDS spreads are all higher as well (more on that later). Europe's open tomorrow is not going to be pretty.